It is a three aisled church, whose central aisle ends up in a half -hexagonal apse. The frescoes that decorate the central aisle, are of the late 14th century and those of the other two, are of the late 15th century. In the southern aisle one sees the iconographical cycle of St. Catherine. The monument was used as a mosque during the Ottoman occupation. According to tradition, Suleiman The Great prayed there, after he conquered the city. 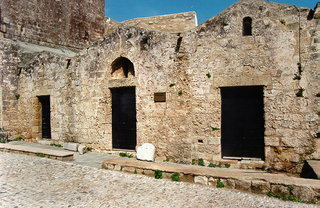 In 1981, during the excavations inside the church, there were found graves in the northern part, arcosolii and simple burials. In 1992, an excavation of the Southern part gave similar results.